Friends reuniting at Asia Divers | . Such a fun day with this mixed group of friends from all over the globe…. 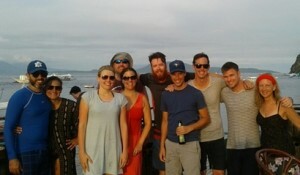 South Korea, USA, Canada, China, Columbia…all getting together in Puerto Galrera! Mike, Bryan, Drew and Jorge tried a “Discover Scuba” while their certified friends joined in for the dive to the Giant Clams. Afterwards celebratory drinks of course at the Barrel Bar.